Maiga is a small island in the Tun Sakaran Marine Park, located 16km north of Semporna. It is a flat sandy cay, measuring 800 metres from north to south and 300 metres at its widest. The maximum elevation probably is 1-2 metres. Maiga is covered by some coconut palms and has nice beaches. 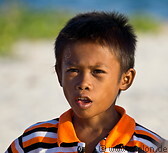 At the southern tip and along the west coast there is a settlement of Bajau, sea gipsies from the Sulu sea. There are no water sources on the island, so probably the inhabitants get the water they need from the nearby Bodgaya island.